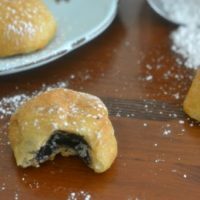 Two ingredients are all you need to make these incredible Ninja Foodi or Air Fryer Fried Oreos. The ultimate fair-inspired food made in the comfort of your own home, without all the oil to fry them in! A flakey outside and as you might in you taste the warm and creamy Oreo center. Be prepared these are highly addictive fried Oreos. I will be honest when we go to our state fair, the first thing I am on the hunt for is fried Oreo’s. It is a weakness, you guys. There is something about the taste of a heated up Oreo blanketed with a tender and fluffy outside. Add on some powdered sugar or eat as is, and take a journey to heaven. 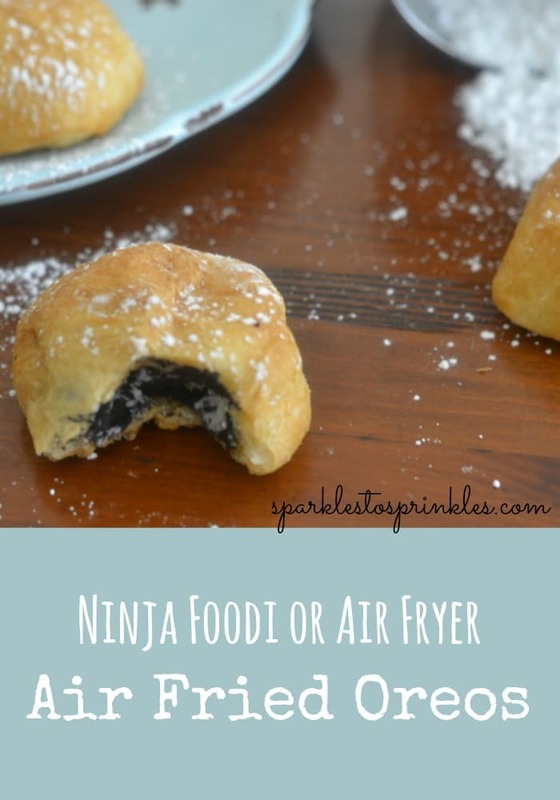 These Ninja Foodi or Air Fryer Fried Oreos are so delicious I can not wait until you try them. Previous to owning my Ninja Foodi I have never had an air fryer. This is one of those recipes, that if you have an air fryer, you have got to make these!! They are the most heavenly little creations that have been served warm in my house. Look how amazing they look when I opened up my Ninja Foodi. If you love these warm delicious treats you will definitely want to try my These Ninja Foodi or Air Fryer Fried Peanut Butter Cups. So the reason I say you can do them in your Ninja Foodi or Air Fryer is that they both offer the crisping method by heating with really high heat without requiring oil. The Ninja Foodi is essentially an air fryer and electric pressure cooker in one. With the switch of a lid, you can go from pressure cooking to crisping up foods. So if you have one of the two devices, Air Fryer or Ninja Foodi you can easily make these fried Oreos. Yes! Just spray your pan down so that they Oreos don’t stick and wrap your Oreos up with the roll. Then bake at 350 degrees as directed below until they are golden brown. By going the Air Fryer or Foodi route, you are eliminating the added oil. You lightly spray your tray so that they don’t stick and that is all the oil you need. This is a ‘healthier’ version to a true fried Oreo. You get the same amazing taste, just without all the extra oil and grease soaked into the dough. 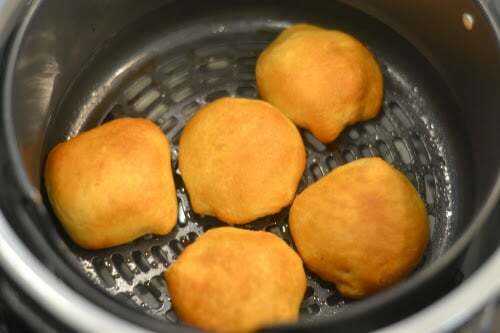 Fried Oreos taste best fresh from your Foodi or Air Fryer. As they cool they will begin to break down a bit and can become gooey or gummy on the inside. I suggest making only what you feel you will eat. Then just save back the rolls and Oreos and then make to order type of route. Trust me, you won’t be disappointed to give this recipe a go. 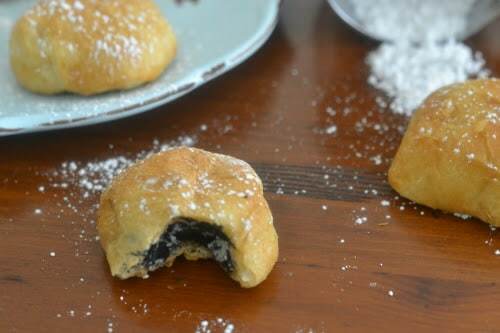 We love deep fried Oreos, and this Air fried Oreo recipe comes in close to copying those vibrant and dreamy flavors you get at your favorite carnival fair foodie stop. This is the recipe you must make!! It is so easy to put together and is the most delicious warm delicious treat. Wrap Oreos in crescent rolls. Cut off excess crescent dough that is not needed to cover the Oreo. Place Oreos in the basket (neat side facing up), I fit 5 at a time. For chocolate lovers… the air fried Oreos are amazing when wrapped in chocolate chip cookie dough! YUM!